The due date for the Tax Year 2017 Second Installment is Wednesday, August 1, 2018. The easiest and fastest way to pay your Cook County Property Tax Bill is online. You can also pay property taxes at participating community banks. You can pay your Cook County property taxes at any Chase Bank location in Illinois, including ones outside Cook County. If you are unable to pay online, you may present payment with a tax bill payment coupon for the current Tax Year 2017 Second Installment (payable in 2018) and prior Tax Year 2016 (payable in 2017) taxes at any of the nearly 400 Chase Bank locations in Illinois. Including this information on your check helps us to reach you if there are any questions regarding your payment. You must present a tax bill payment coupon, such as the one you received in the mail with your tax bill. You may print a duplicate coupon on our website. Printouts from our website of other payment information will not be accepted. Through the dates listed on the bill, you may submit payment using cash, standard checks, money orders, cashier’s checks or certified checks drawn on any bank. Partial payments are accepted at Chase Bank. You must submit one original payment coupon and check per PIN. You will receive a dated receipt. 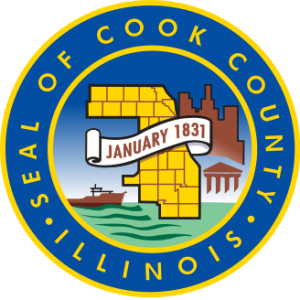 More information available at the Cook County Treasurer website.